Please call owner John at 630-336-3663. Boat Location: Illinois River at Starved Rock Marina Ottawa, Illinois. 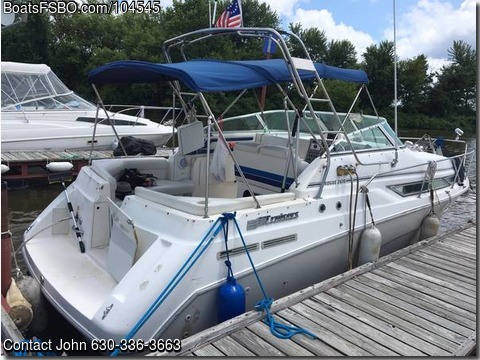 For sale by owner 1993 Cruisers Yacht 2670 Rogue, well maintained & cared for boat with all paperwork since day one. It has many extra options: Bimini Top, Full Enclosure, Cockpit Cove, Beam 9'6" Trailer: Included, Engine Type: Single Inboard/Outboard Engine Make: 7.4 Bravo 300 HP Mercruiser, 800 hours on engine, new fuel pump and fuel filter, water pump, stainless steel prop and new spare prop, new seat covers and new isinglass curtains full camper top and mooring cover. New impeller. 2 New batteries. Swim Ladder All new fluids. New window and hatch covers. Currently located on the Illinois River at Starved Rock Marina Ottawa IL which is 1.5 hours from Chicago. Easy to back into slip!! Clean titles for boat and trailer. 2 sets of 30 amp power cords, 10 life vests. Full head, heating and Air conditioning works awesome. I will be only showing the boat on weekends while we are down at the river. Come on down for test test drive! You can use the slip for the rest of the season!! If you want to see it weekends are best or I can make a special trip on a week night. $11,500 OBO.